Volkslager T-shirt. Here’s a bit of Octoberfest fun for you all. 100% cotton shirt in light 155gm cotton especially for hot summer days, having a few cooling ales. The Volkslager T-shirt is styled on a classic beer label printed on Black shirts for all the guys and gals that like a beer or nine! 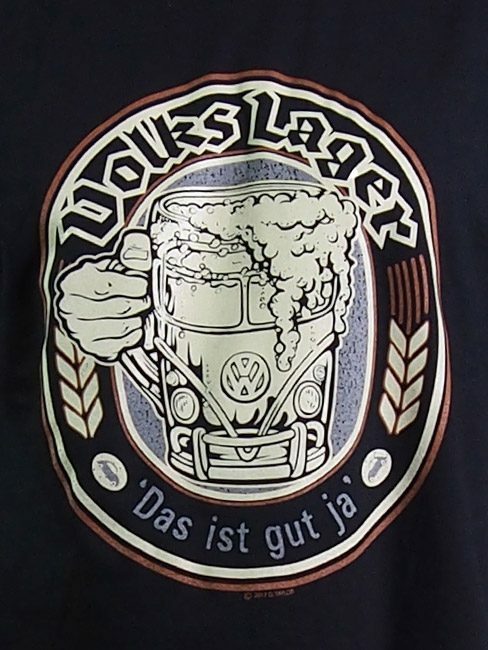 The drawing is of a classic beer stein from the Octoberfest in Germany and transformed into the front of a splitty. A bit more fun for you all to enjoy!